I travel around a lot, and that means a lot of my time I can’t read. Bus trips of 40-80 minutes are extremely difficult times because I have to conserve battery power on my phone while trying to not waste that time. If I had physical copies of books it might be a bit easier, but I don’t for most of them. 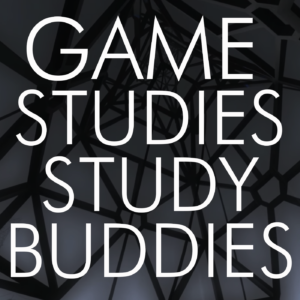 Enter Game Study Study Buddies, by Cameron Kunzelman and Michael Lutz. This podcast is a long-form treatment of academic game study books, and when I’m travelling it’s one of the things I can do that feels meaningfully productive for both easing me into a text or reconsidering one. They only do an episode a month, which is a bummer but it’s really interesting stuff if you’re interested in academic consideration of game studies. The books they focus on are definitely biased towards videogame culture, except when they go back and do the Grand Olde Texts like Man, Play, Games. But that’s okay, because that’s what most of the people around me are interested in. I like this podcast and I even sponsor it on Patreon. You might like it and want to check it out just for interest’s sake.